Could GMO corn be responsible for increasing childrens’ IQ? This excerpt appears crafted to suggest that planting GMO crops has 1) lead to increased reliance on pesticides similar to those used by the Nazi’s, 2) those pesticides have caused a remarkable drop in our children’s intelligence, and 3) that giant corporations have made billions from poisoning our children. But the truth of the matter is exactly the opposite. The “one class of insecticides” that Mr. Hakim refers to in the second paragraph is the organophosphate group of insecticides. This group of insecticides is generally acknowledged to be relatively toxic compared to many other types of pesticides. But GMO crops (Bt crops in particular) have reduced the use of this class of insecticides. Before widespread adoption of Bt corn, over 12 million pounds of organophosphate insecticides were being sprayed annually on U.S. corn acres. By 2014 (the last year USDA surveyed corn pesticide use), organophosphate insecticide use had dropped by 98% to around 230,000 pounds. 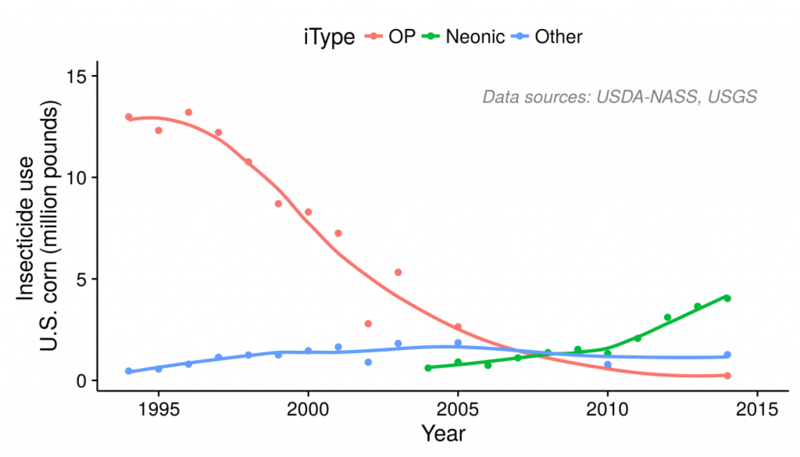 Not only did Bt crops reduce insecticide use by the farmers who’ve adopted the technology, but they have in some cases created a ‘halo’ effect that has reduced spraying by non-adopters as well. Bt corn was so effective for European corn borer (ECB) control in the US, the population of this once-common pest has decreased to the point that non-GMO corn growers no longer have to use insecticides either. That’s a pretty remarkable success when it comes to reducing pesticide use, if you ask me. Contrary to my post title, I’m not going to try and claim that adoption of GMO crops has increased childrens’ IQ. But I find Mr. Hakim’s implication that the opposite has occurred to be completely without merit.